The development of digital technology, especially mobile communication and telehealth, have led to the emergence of micro-insurance that cover the health risks of low-income families, which are generally uncovered by traditional insurance products. 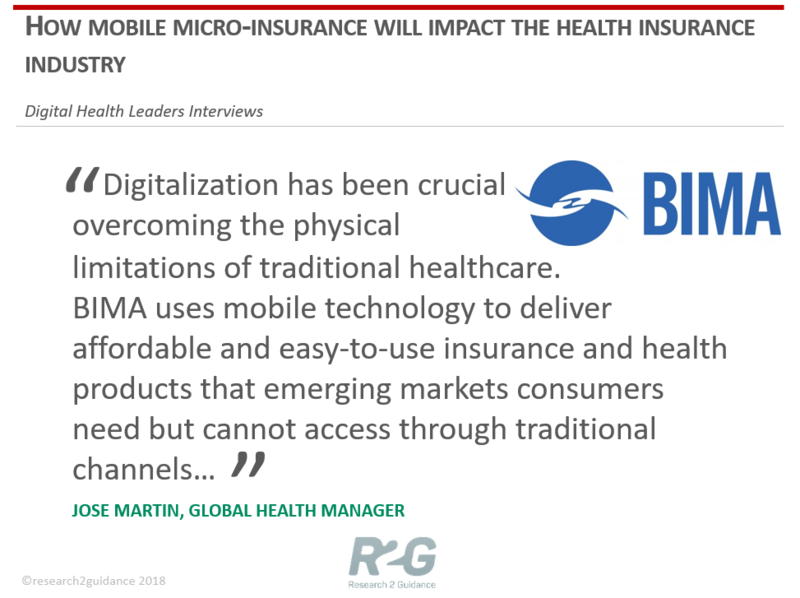 To find out how mobile micro-insurance can unlock the global potential, we talked with Jose Martin, the Global Health Manager at BIMA. According to the report “The 10 Disruptive Digital Health Business Models For Health Insurers”, mobile micro-insurance refers to the health insurance plans that cover short-term small health events (e.g., weekend sport insurance) or minimal ongoing health insurance (e.g., dental insurance). The cost of plans is inexpensive, members can opt to reduce their payment during difficult times with lower coverage. The micro-insurance model has been applied in developed and developing regions of the world. The implementation differs depending on the region. In developed countries, implementations make use of digital technology (e.g., apps, mobile webpages) to mainly support the selection and purchasing process of small insurance packages on the go. Micro-insurance packages tend to be linked to single events and non-regular health risks. Payment is mainly via credit card. In developing regions, micro-insurance products provide ongoing but limited health insurance coverage. Monthly micro-payments are deducted from the monthly phone bill. In addition to online distribution channels (e.g., websites and mobile apps), street agents are used for member acquisition. Widely recognized as a leading force of micro-insurance innovation, BIMA is a good example to demonstrate how a mobile micro-insurance company could unlock 26 million customers in 15 developing markets within 8 years. To find out more about how BIMA has gained ground in micro-insurance markets, we interviewed Jose Martin, the Global Health Manager at BIMA. Research2Guidance: What is your business model? Jose Martin: BIMA uses mobile technology to deliver affordable and easy-to-use insurance and health products that emerging markets consumers need but cannot access through traditional channels. We have created the first digitalised mobile insurance model by integrating our proprietary mobile insurance platform with the billing infrastructure of mobile operators, enabling customers to register and pay for insurance premiums entirely via their mobiles. This innovative approach removes high distribution cost and provides an effective recurring payment channel for the unbanked. Our strategic partnerships with leading mobile operators have enabled us to achieve scale quickly. Globally, we also employ a 3500-strong agent workforce dedicated to educating customers about insurance and our products to ensure responsible selling. Research2Guidance: How do you build trust with your members and keep them engaged? Jose Martin: We realise that to keep customers engaged, we must increase customer touch points and interact with them in a way that truly offers value. We have therefore been developing several new product features to complement our existing tele-doctor services as well as to bridge the gap between mHealth services and traditional healthcare channels. We have, for example, introduced free Health Programmes offering customers advice and preventative tips on managing common health conditions. There are currently four programmes available – Stay Healthy, Lose Weight, Women’s Health & Child Care, and Diabetes & Hypertension. The content is currently delivered via SMS, but we are also exploring other delivery channels such as Interactive Voice Response, our own consumer-facing mHealth app and social media. We are also piloting appointment booking service with our network of approved hospital partners to enable customers continuity of care, shorter waiting times, and discounts with medical providers. Since pharmacies and laboratories are typically the first stop in the health journey for people in emerging economies, we are developing partnerships with these health outlets to offer customers consultations at pharmacy booths and discounts in medicines. Research2Guidance: How many members are using Teledoctor services? Jose Martin: Our mobile health services have already reached over 1.4 million customers across four markets including Bangladesh, Ghana, Pakistan and Paraguay. BIMA has over 100 doctors providing tele-consultations and is already offering 350,000 medical consultations per year. Research2Guidance: Do you have any competitors? How do you respond to them? Jose Martin: We see an increasing number of companies offering mobile health services in emerging markets. However, in contrast to BIMA’s multi-market approach, the majority of mobile health providers only operate in one signal market. Because of our global presence we are able to acquire a large volume of insight and knowledge on the needs and behaviour of emerging markets consumers. This competitive advantage allows us to take a truly customer-centric approach in our product design and to apply our learnings in different markets to improve our product offering. Our strength also lies in our ability to provide insurance-led mobile health services. Since the insurance and heath components of the product package are linked to and reinforce each other, we can create a unique, holistic health bundle offering customers protection against both financial and health risks. We also believe that it is important to continuously develop our customer proposition to offer fully integrated online-to-offline health services. Research2Guidance: Where are the main barriers for the mHealth insurance market in developing countries? Jose Martin: I see four main barriers. Firstly, the lack of structural information and relevant data on healthcare, such as utilisation, accessibility, health needs, spectrum and frequency of illness, is definitely a hurdle. A second barrier relates to the types of products that are brought to those markets: replicating the offering of developed countries often lead to disappointing results in emerging markets. What is needed is a local product design process accounting for the health journeys and healthcare infrastructure in a local context – in the developing world, these journeys are often very different to the ones in developed economies. Another barrier is affordability: it is crucial to adapt offerings to the income levels of the locals so they have the potential to reach the masses. 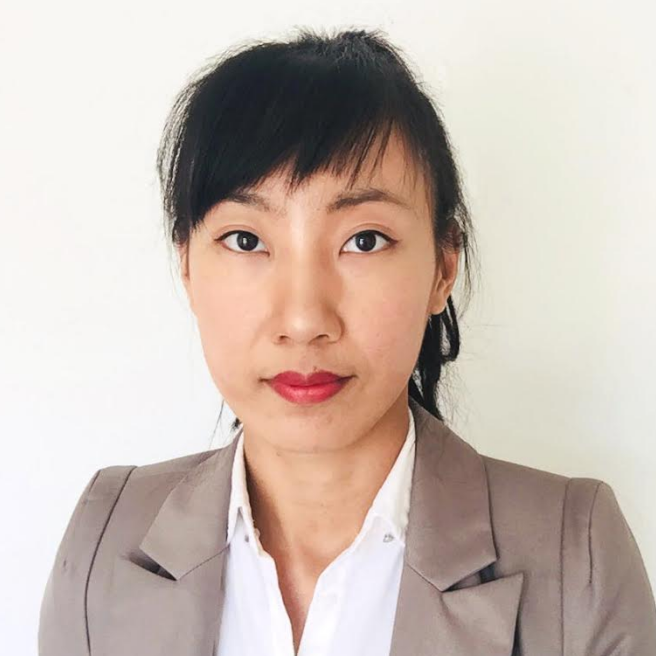 And the final barrier is regulation – in most emerging markets, digital health is a relatively new industry and is therefore not regulated, which creates uncertainty and could discourage investment in the sector. Research2Guidance: Which drivers do you think will shape the mHealth market in the future? Jose Martin: Regulation will be one of the most important drivers for mHealth – the growth of digital health products will largely depend on the development in the regulatory landscape and whether the regulatory framework is conducive to encouraging market entrants of mobile health providers. A second driver will be public private partnerships which will be a critical factor in advancing mHealth development in the short term. It is also of particular interest to the governments in the developing world to broaden the reach of healthcare and improve access to quality health services, which can be facilitated and accelerated through the support of the private sector. A third driver will be the pace of broadband development. It is already happening to a degree but is very slow going. Technology will be a critical enabler and increased penetration of broadband will give rise to more sophisticated healthcare delivery channels such as mobile app or video consultations, which are not available on feature phones given their very limited capabilities. Research2Guidance: What does digitalization mean to you? Jose Martin: Digitalization has been crucial in overcoming the physical limitations of traditional healthcare. In the past, patients could only visit a doctor in person, but it is now possible to have remote consultations via voice, video, instant messaging or email. The ability to deliver healthcare without the confines of physical space represents a sea change for patients, in particular emerging markets consumers who often find it challenging to access healthcare due to costs, distances and availability. More importantly, digital health services can help patients better manage chronic diseases through constant monitoring and provision of information to influence behavior, which can lead to economic efficiency. Although digitalization provides a wealth of possibilities, for it to reach its full potential, the healthcare environment needs to be ready. Enablers such as phone connectivity need to be in place and developed. If the potential of digitalization is properly exploited, web-based consultation is going to have a profound impact on improving accessibility to quality healthcare services, as well as increasing reach of patients and reducing out-of-pocket expenses. Research2Guidance: How will you leverage the opportunity of digitalization? Jose Martin: At BIMA, we have developed Doctor Portal, our proprietary platform for conducting structured tele-consultations and for storing electronic health records of our customers. The solution supports multiple languages, dialer integration and data encryption. This allows us to scale and roll out a single platform across multiple markets efficiently. The platform also helps us enhance operational metrics and improve the quality and standardization of the medical records collected. In addition, we are currently developing an mHealth app to increase engagement and give customers a richer experience. The app will drive critical behavior – such as reminders to take medicines or exercise – and will provide customers with educational and preventative health advice around different health coaching programmes. As the mobile health app will be linked to our platform Doctor Portal, it has the capability to store medical histories, enabling our customers access to digital health records for the first time that will result in more effective treatment and consistency of medical care. Research2Guidance: What trends do you see in the digital health insurance area of the future? Jose Martin: I believe we will see a diversity of players emerging in developing economies. These will include well-established, traditional international insurers, insurance specialists that operate exclusively in the emerging markets, as well as technology companies who have traditionally not been active in the healthcare space now taking an interest in it. In developed countries, the likes of Facebook, Amazon, and Microsoft are making a move into healthcare. We will likely see the same trend in emerging markets in the coming years as broadband connections become more popular. At the same time, there will be more product diversity – an increasing number of insurance products will be designed with emerging markets consumers in mind where pricing will be adapted accordingly for the mass market. Moreover, pure insurance offering will give way to integrated products and bundled services combining insurance and other elements such as healthcare. This convergence of products will deliver more customer value. Research2Guidance: Thank you, Jose Martin, for your answers. We wish BIMA all the success. BIMA is one of the 10 best-in-class examples covered in the new digital health report “The 10 Disruptive Digital Business Models For Health Insurers”. The report illustrates how the digital health insurance models have been implemented including details of their target group, service offering, revenue model and evidence of success. To learn more, click here.